Go for a tan trench coat and white jeans for your darling for a stylish and sophisticated look. 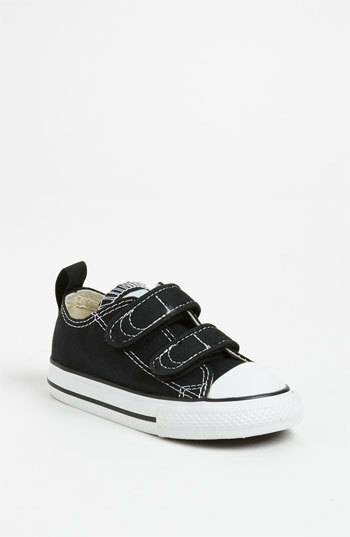 Converse chuck taylor double strap sneaker from Nordstrom are a wonderful choice to round off this style. 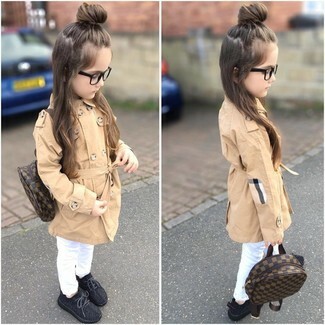 Teach your child to take pride in her appearance by suggesting that she reach for a black coat. 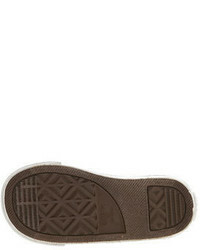 Finish off this style with Converse chuck taylor double strap sneaker from Nordstrom. 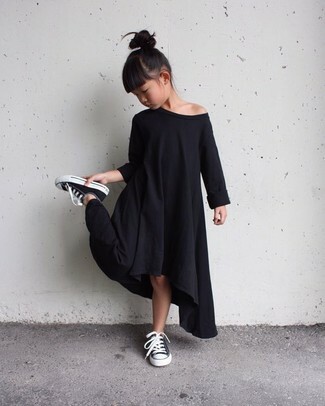 Suggest that your little fashionista go for black dress for an elegant, fashionable look. Black sneakers are a good choice to complete this ensemble. 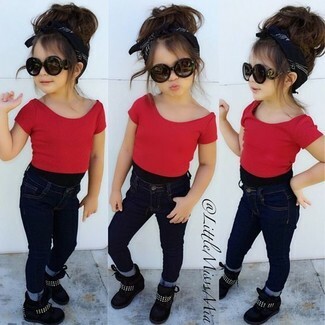 Suggest that your tot pair a red t-shirt with navy jeans for a comfortable outfit that's also put together nicely. 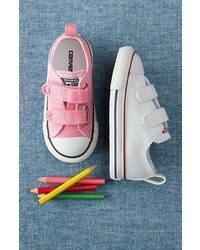 As for footwear your little one will love Converse chuck taylor double strap sneaker for this ensemble. Suggest that your darling reach for a grey sweater and blue denim overalls for a laid-back yet fashion-forward outfit. 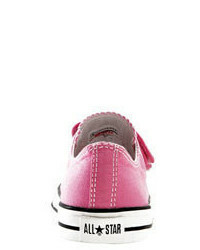 Converse chuck taylor double strap sneaker are a good choice to complement this style. For an everyday outfit that is full of character and personality reach for a white and black long sleeve t-shirt and navy jeans for your child. Black sneakers are a savvy choice to finish off this getup. 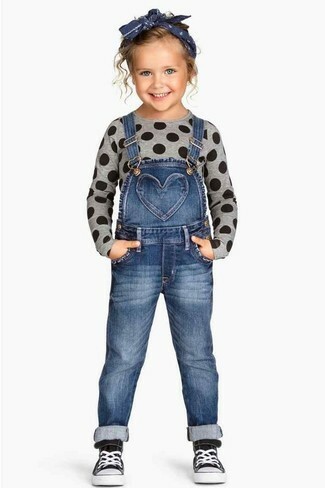 Suggest that your tot pair a grey sweater with blue denim shorts for a glam and trendy getup. 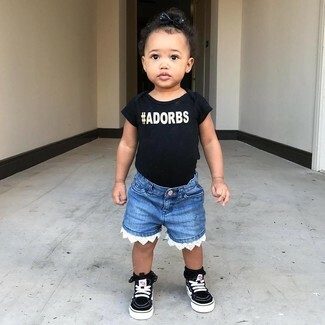 As far as footwear is concerned, suggest that your little girl throw in a pair of Converse chuck taylor double strap sneaker. 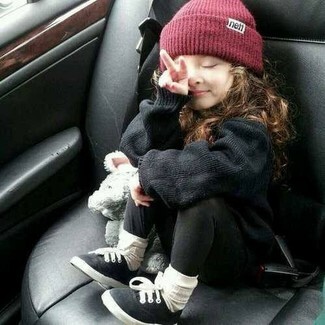 Reach for a black sweater and black leggings for your kid for a comfy outfit. Black sneakers are a great choice to complete this style. 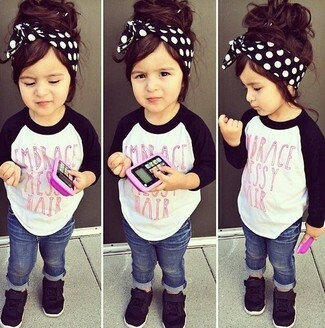 Choose a black print t-shirt and blue denim shorts for your daughter for a fun day in the park. Converse chuck taylor double strap sneaker are a nice choice to complete this getup.